During today's Nintendo Direct broadcast Nintendo lifted the lid on its take on the Free-To-Play concept with an entirely new game: Rusty's Real Deal Baseball. A collection of minigames which attempts to harness the "good feel" of the sport of baseball, this eShop download is free and contains a trial game, but to access other events — based around elements of the sport such as batting, pitching, fielding, and so on — you have to buy them with real money. 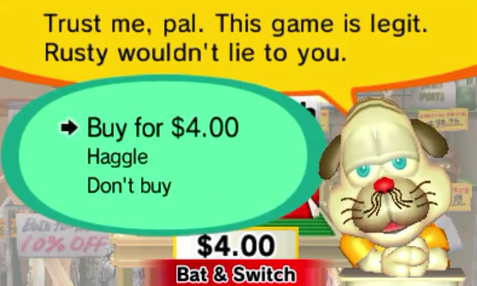 Each title has a starting price of $4, but in an interesting twist, players can bribe Rusty with in-game items and haggle for a cheaper cost — which is reflected in the real world price of the game. Presumably, these bribe items are limited and cannot be used indefinitely; while solid details haven't been revealed, it seems likely that skillful play in the game itself will yield more items which can be used to get on the good side of Rusty. You can also lend him your ear and listen to his many problems, which also results in a lower price. The game is due for release in April, and was only included in the North American version of the Nintendo Direct broadcast — which would suggest that Nintendo is releasing it in that region first before pushing it elsewhere. Ex-pro baseball player and dog Rusty Slugger owns a sports shack. He’s broke with 10 puppies to feed, so he offers a variety of baseball mini-games for sale, themed around the simple pleasures of baseball. Players can bat, pitch, catch and even umpire. The initial software containing a part of the first mini-game is free, but players can purchase additional mini-games in a unique way: by haggling to lower the real-world price for each downloadable game. Additional games start at $4 apiece, but giving Rusty items or listening to his problems might improve his mood and motivate him to offer steep discounts. What do you think of this new approach to freemium gaming? Could Nintendo be looking to reward gamers who put the hours in with this unique mechanic? Could it catch on in other titles? Share your feelings by posting a comment below. I'm probably in the niche minority but this game looks amazing. I was laughing at every stupid pun in that trailer. 'Bat and switch', 'rusty slugger'. I'll definitely download it and buy some of the mini-games. Looks like an interesting concept. I look forward to seeing how people like it. I only have 1 question. I know a Nintendo Network ID is required for free content, but I heard paid content does not require one. Will this game require a Nintendo Network ID? Err, a nice take on freemium. But it's still freemium, which is, you know, awful. This has to be market testing. Seems like it is going to be a total ripoff. The only ok type of freemium is like Dota 2 (Cosmetic items only). How very clever! Leave it to Nintendo to come up with something new for free-to-play! In my opinion I don't think its a Free-to-play game....Its more of a demo. I like the idea. but I have to agree with @unrandomsam its more of a ripoff. Looks interesting but I wish it wasn't baseball tho. I'll bite looks really fun. Has potential to become a broad healthy franchise even (fingers crossed) a fantasy league type game. I really enjoy baseball so I think I will definitely enjoy this game...I'd rather not go the free to play micro transactions route but I'll most likely still get it!!! I don't mind new courses, new items, skins etc. but not this. This is a demo with the rest of the game hidden behind fee's, I don't see the difference between this and other dodgy DLC offerings. It's alright, Ma! If I can please him! @mcusc5435 There is nothing positive about freemium especially the modern definition of it (give a tiny bit and then charge consistently and indefinitely). The old shareware model was fair I think - first 1/3 for free pay for the last 2/3's. Interesting Idea. I see Nintendo is picking up the Micro-transaction payments. I'm the kind of person who would feel bad about paying less than full price to support Rusty and his kids. I love the approach. A demo that rewards your time and play by making the final product cheaper. Anything with a lil "Nintendo twist" is gonna be expensive. $4 per mini-game?? @XFsWorld Depends how much there is to it but I cannot imagine even at $2 per mini game it would compare favourably to say mini's on the move (Which I thought was very fair when it came to the amount in it). Although it is a funny concept, it still is a rip-off. Free-to-play is the worst thing that has ever happened to gaming. How is anyone saying it's a ripoff when you have no idea how much depth the games have or how much they will "really" cost after haggling. He did say significant discounts, maybe they only cost like $1. And why is everyone instantly against this pricing model? 10 mini games for $1 each is no worse then all for $10. The price model isn't inherently sketchy, only when developers revolve the gameplay around incentivize players to purchase more. As long as the total price for everything is reasonable, and we don't know whether it is or isn't, then this is just fine. It's unreasonable to expect it to be free. @ueI Yes, a NNID is required to download this game as it will be a free download, paying for the game will be done via in-game DLC, the same as Steel Diver: Sub Wars. This marketing idea is SO clever I actually like it. In game purchases, Nintendo style. I, for one, didn't see this one coming. On top of that, all without degrading the big name franchises. @AlbertoC good point. I agree, there testing the waters and trying new things. It's how you grow. Moving in the right direction toward new paths, excited about these new titles. I like this idea. I think it's a really cool take on the concept of free-to-play gaming, and as a huge baseball fan, I'm fine with the game being related to baseball; I can't wait to try out the umpire mini-game. @unrandomsam Freemium is free to play but pay to get stuff, as opposed to this being a demo where you can buy only the minigames you want - kind of like Wii Sports Club HD would have been if it gave one sport for free, or Tank x3, or the Street Pass Mii Plaza games. You can refuse to pay money to actually get more gaming fun, but you'll miss out on what you might find really enjoyable. @DarkCoolEdge so you would rather pay $50 for a five minigame collection than $20 for the only two you actually would want to play? Not all free to play is horrible. This is actually pretty cool. I actually wanna try this game just for the haggling, I could care less about the mini games. Seems legit. I'll give this a shot when it arrives. I hope, this game comes to europe! It has a StreetPass Puzzle! Not really a fan of baseball sims. Not sure I like where this is headed with the microtransactions. The "haggling" system seems like Nintendo is conducting marketing research to see how much people are willing to pay so they can use these figures to calculate future freemium games. What's next? A free-to-play Mario where you spend cold hard cash to buy powerups such as Tanooki leafs or cat bells? I reeeealy hope this gets a european release. It won't sate my thirst for a real baseball game on a Nintendo system, but it does looks all sorts of fun. Plus, I think the pricing model is actually super interesting. For 10 StreetPass Hits you'll get a 1$ discount voucher. After 25 you'll get a 50% discount voucher. Well, at least its working this way in the japanese version. I was joking to a friend saying I was going to rush out and preorder it, but it does look like a lot of fun, even for someone who isn't really a fan of baseball. And being free? Yeah, I'm getting it! I think it is more of an experiment than a game. Nintendo is testing the waters to see what will work in the market and what will not. I want a full fledge baseball game on my 3DS and WiiU. Still holding out hope RBI Baseball 14 comes to 1 or both of them. I love baseball, and the game looks like it feels pretty authentic and fun. I'll definitely be getting this. @XCWarrior It probably won't come out for the 3DS, but I see it coming to the Wii U. Baseball is big in Japan. I'll give it a chance. I feel better about paying for different mini-games then power-ups that turn a game to pay-to-win. I want more quality baseball titles on the 3DS/Wii U, though I know we'll never see a return of my all-time favorite baseball game: Ken Griffey Jr. Presents Major League Baseball. @Mr_3DS By that logic, there would be a 3DS version since in Japan, 3DS is the only system that is selling. It's really interesting to me! ...Although that dog's design really lowered my odds of buying anything. @Captain_Bagel I know, right? That's why this concept is so brilliant... it's not based on some arbitrary energy meter or gems to "buy" more time or better stats into a game. Here you're trying to swindle a poor guy whose family is hungry. Your gain is this character's loss. Even though he's, you know, an animated dog. I love how they're using emotion and guilt as a gameplay mechanic. Can't wait to try it. "The game is due for release in April, and was only included in the North American version of the Nintendo Direct broadcast — which would suggest that Nintendo is releasing it in that region first before pushing it elsewhere." I think it's been out in Japan for a while. This looks like 「だるめしスポーツ店」.